Muscovite Mica is one of a wide range of rock-forming minerals and is produced in all three major rock types. Mud-like rocks can form sericite during metamorphism in low-level areas, and become muscovite when the degree of metamorphism is slightly higher. A large amount of Muscovite Mica Powder is formed in the late stage of acid magma crystallization and in the stage of pegmatite. It can also be generated during the process of alteration from high temperature to medium and low temperature. The so-called Yunying lithification is one of the high-temperature alteration effects, which can form a large number of muscovite. The so-called sericitization is one of the low-temperature alterations and can form a large number of Sericite Mica. Muscovite is weathered and broken into very fine scales, which can be either debris in clastic sediments or one of the mineral components of argillaceous rocks. Muscovite oblique square column crystals, usually in the form of plates or sheets, forming a pseudo-hexagon or diamond shape. The cylinder has obvious horizontal stripes. The twin crystal is common, and the mica law is generated by contact twin crystal or intercalated triple crystal. 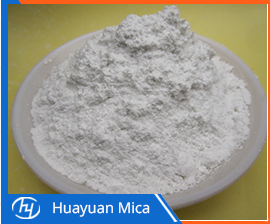 Huayuan Mica is one of the main Mica Powder production and processing bases in North China.